Electric buses are propelled by motors and run on electricity. Unlike traditional diesel-powered buses which are fitted with internal combustion engines, electric buses have zero-emissions and produce less noise. Given its environmental benefits, several cities have adopted it for public transport solutions. 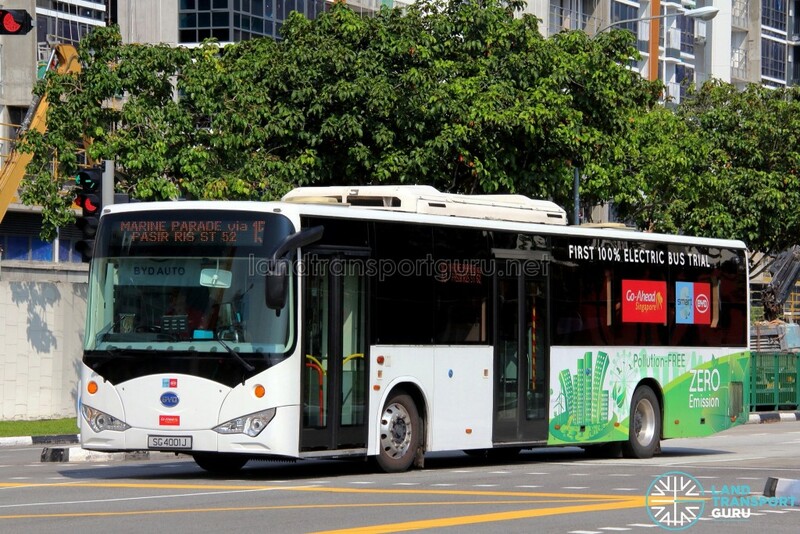 In Singapore, electric buses are being explored for wide-scale future use. While still in its early stages, electric buses are expected to gain traction in the coming years with the Land Transport Authority (LTA) spearheading efforts to incorporate them into the public bus fleet. 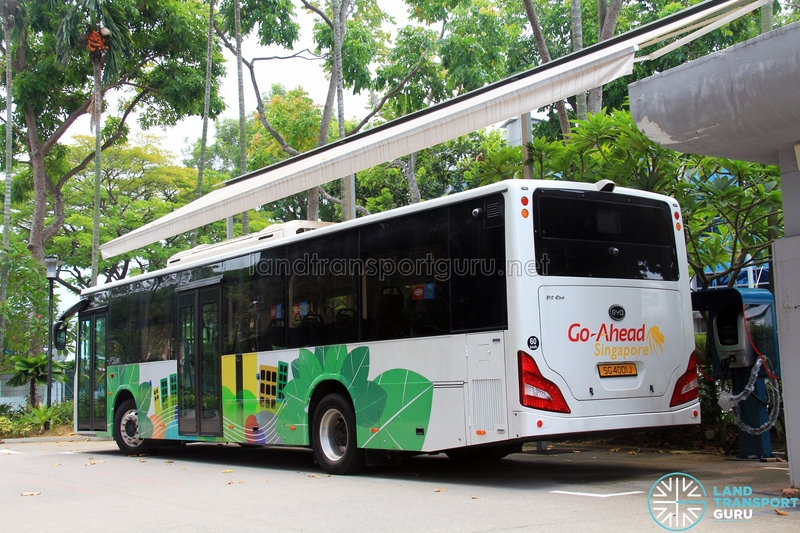 For a highly urbanized environment like Singapore, electric buses offer clear advantages. With zero tailpipe emissions, the bus does not contribute to urban air pollution within the immediate vicinity, while also reducing noise pollution. In the mechanical aspect, electric buses are also far simpler than buses with internal combustion engines and require less maintenance, hence lowering operating costs. There are several main types of electric buses, differing in their method of energy storage and operating principal. The most prevalent type is the battery electric bus, which stores energy onboard in a chemical battery, with Lithium-Ion and Iron-Phosphate varieties being most popular. A variant of this technology is used on the supercapacitor or ultracapacitor bus, where capacitors are used instead of batteries to store their energy. While capacitors store far less energy (~5%) for the same weight as compared to conventional batteries, they are able to charge and discharge very quickly, making them more suited for bus routes that stop frequently and predictably. NTU’s Supercapacitor Bus (discussed later) is based on this principle. However, for conventional bus operations, battery electric buses are most suited for public bus routes. There are also vehicles which need a constant source of electricity (such as trolleybuses), but such vehicles require a network of cables to supply electricity. Such vehicles are unable to travel freely and must stay within the electricity grid to function. Finally, the plug-in hybrid bus combines the plug-in charging capabilities of electric buses with a conventional hybrid bus drivetrain (thus, essentially hybrid buses designed for external battery charging). Limited examples of such bus models, with examples being the Volvo 7900 Electric Hybrid and the ADL Enviro400VE. Among battery electric buses, two distinct design philosophies have been adopted. The conventional, depot-charged buses (still favoured by Chinese bus manufacturers) is to place a large number of batteries on every bus to achieve sufficient operating range over a day’s worth of revenue service. However, equipping buses with heavy batteries makes them more expensive and heavy (and to some extent, decreased cabin space), which increases the strain on the battery, raising both energy consumption and life-cycle costs. On the other hand, the Opportunity Charging approach is favoured by European bus manufacturers. Charging points (typically overhead charging) are erected at the end-points (or en-route stops) of a bus route, which sufficiently recharges the bus in a short amount of time (usually several minutes) before the bus continues on its next trip. With fewer batteries required per bus, its advantages translate to a more spacious bus interior, lower environmental cost of battery production, and lower electricity consumption through reduced vehicle weight. Disadvantages include the lack of deployment flexibility (on non-infrastructure-equipped routes) and the possible impact on bus operations should a charging station break down, and some redundancy is thus required, such as installing multiple chargers at terminating points. Currently, efforts are focused on expanding the use of opportunity charging on suitable routes and the adoption of similar charging infrastructure between bus manufacturers, allowing multiple bus models to use the same charger. Singapore has a demanding environment for electric buses. To avoid compromising the efficiency of the current public bus network, electric buses must operate at levels of high availability throughout the day (at similar levels as their diesel-powered counterparts), which often requires buses to operate for over 20 hours per day. Two major issues facing electric buses are range and charging. Not only must electric buses have the adequate range for performing several trips of a bus service, they must also be supported by charging infrastructure installed in depots and bus interchanges, usually in the form of cable charging or overhead charging. Overhead charging is a common charging method for electric buses using the opportunity charging principle, which quickly charges a bus at the end termini of a bus route (in as little as a few minutes). A third form of charging, less commonly used, is that of wireless inductive charging usually installed underneath the road surface, and requires no physical contact with the bus. The power drawn from these charging stations (especially when implemented on a large scale) is significant, and surrounding power infrastructure must be able to cope with their power usage. In addition, the warm and humid climate poses challenges for the performance and longevity of electric systems. Air-conditioning systems consume large amounts of energy particularly in Singapore’s climate, which puts additional strain on a battery and hence the bus’ overall range. Go-Ahead Singapore trialled Singapore’s first fully-electric bus from November 2016 to May 2017. The BYD K9 bus was produced by established Chinese electric vehicle manufacturer BYD. The trial was intended to assess the suitability of electric buses for public transport. Initiated by the Land Transport Authority, the electric bus trial operated on 3 bus routes, 15, 17 and 119. 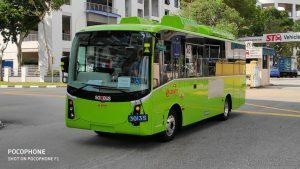 The e-bus trial was part of the EV test bed led by LTA and the Economic Development Board to trial fleet-based EV operations, a follow-up to the earlier phase which ended three years ago and involved individual corporate users. The LTA also added that the bus will operate trips on top of those scheduled, and hence will not cause an adverse impact on service levels. Charging equipment and infrastructure was installed at Go-Ahead‘s depot in Loyang. to support operations of the e-bus. 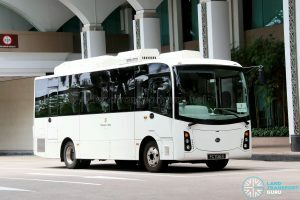 The K9 bus requires between 5 and 10 hours to be charged fully, allowing it to run for 250km, but its range could be lower due to the warm climate in Singapore, with additional battery power used up for cooling. During the Ministry of Transport’s Committee of Supply Debate in March 2017, Second Minister for Transport Ng Chee Meng announced that LTA would be calling tenders to purchase 50 hybrid buses and 60 electric buses in 2017. Contract PT323 – Procurement of Electric Buses was put up by LTA on 12 December 2017. The 50 Single-deck and 10 Double-deck Electric Buses are expected to be delivered between 2019 and 2020. The BYD C6 and D6R are midibuses with a capacity of around 24 passengers. More information about these buses on their respective articles. 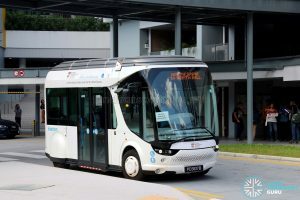 A collaboration between BlueSG and NTU brought in a Bolloré Bluetram, an electric supercapacitor bus. Named the NTU-Blue Solutions Flash Shuttle, the vehicle will be used as a short-haul shuttle bus, whilst the vehicle is performance evaluated on Singapore roads. It is manufactured by French transportation company Bolloré, of which BlueSG is a subsidiary. The bus can travel 2km on a single charge, with backup power that provides for an additional 30km. More details on the trial and bus at the main article, Bolloré Bluetram. 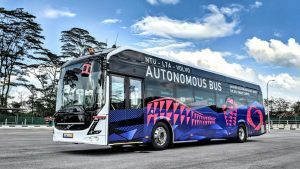 Two units of the ST Autobus are being used as a testbed for autonomous development. More details on the trial and bus at the main article, ST Autobus. Two Volvo 7900 Electric buses are being supplied as a testbed for autonomous development. As a partner, SMRT would also assess the buses at a depot to see if the vehicles can navigate into washing bays and park at charging stations. 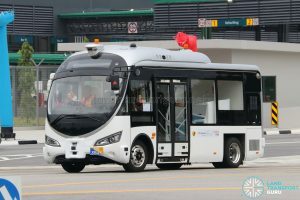 See Autonomous Buses in Singapore for more information. 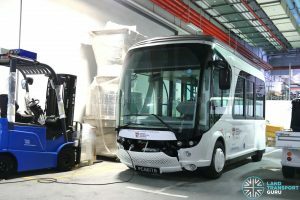 More details on the trial and bus at the main article, NTU-LTA-Volvo Autonomous Bus Trial. ST Engineering (Land Systems), in cooperation with Finnish electric bus manufacturer Linkker, is undertaking a project to refit an existing MAN NL323F bus into an electric bus. Information with regards to this modification project is scarce, but ST Engineering’s 2017 Annual Report revealed that the company was awarded an LTA tender to “retrofit a single-deck electric MAN bus as proof-of-concept”. The tender is believed to be a closed tender, with LTA not making any references to the tender within its annual reports published in that period. 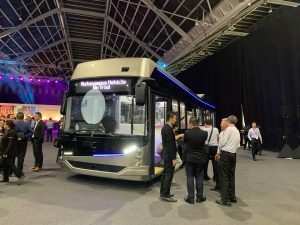 At the same time, ST Engineering is working with Linkker to bring its electric bus technologies into the Singapore market. ST Engineering (Land Systems) are bringing in several electric buses as a testbed for autonomous bus development. The electric bus will be based off the Linkker 12+, a full-size electric city bus made by Finnish manufacturer Linkker. ShareTransport, a subsidiary of Commute Solutions, owns several 24-seater BYD C6 electric buses for use on on-demand routes. HDT Singapore Taxi owns a 12-metre BYD C9 coach (registered PC6284C) equipped with a wheelchair ramp. 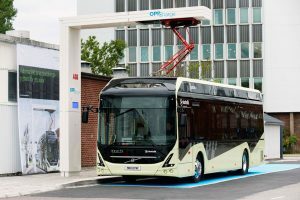 Opportunity charging of electric buses is gaining popularity in Europe with bus manufacturers producing buses capable of supporting overhead charging. One such overhead charging platform is OppCharge, an open and competition-neutral interface supplied by Swiss-Swedish engineering group ABB. By being compatible with multiple bus manufacturers, Oppcharge offers bus operators choice and flexibility of buses without the need to modify existing charging infrastructure. These overhead pylon chargers with extendable pantographs are usually installed at the end stops of bus routes, allowing buses to quickly receive a full charge in-between trips. Charging is fully automatic and secured by a two-way WiFi communication sequence. The driver gets a clear indication in order to stop within the specified ± 200 mm from the reference point. The charging sequence is started by activating the parking brake, and the driver can interrupt it at any time. 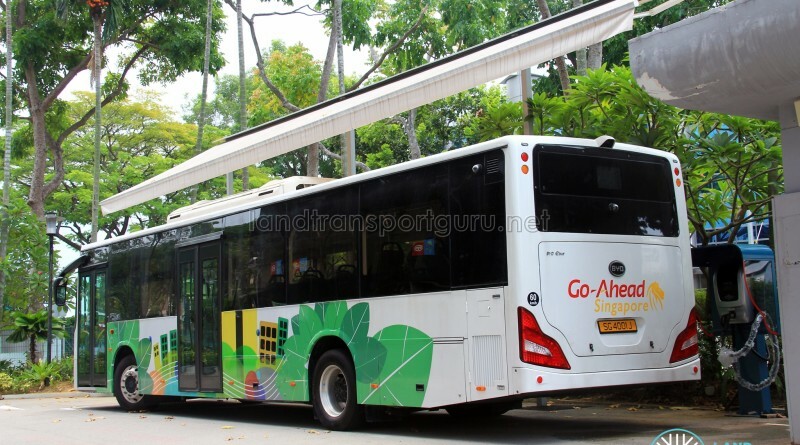 Electric buses have also entered the Malaysian market. The BRT Sunway Line in Kuala Lumpur is fully operated by 15 battery-electric BYD buses (some of which were later redeployed outside the Bus Rapid Transit network). In addition, the Putrajaya region trialled 10 pantograph-charging electric buses in 2016 and has since procured 150 more units on delivery. These buses are operated by Nadi Putra. 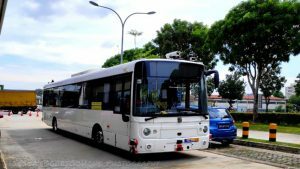 Most recently, electric buses were rolled out in the city of Kuala Terengganu on the myBAS service, a new series of residential bus routes to boost the existing bus network. In addition, an Elektrik Bas Inovasi Malaysia (EBIM) program is researching and developing domestic electric bus technology. A large-scale rollout of electric buses is prevalent in China where government grants for electric vehicles are strong. Even before the rollout of electric buses, natural gas buses were increasingly prevalent in Chinese cities. Shenzhen is leading the way in electric bus usage with all 16,359 buses running on electricity, making Shenzhen the first in the world to have a citywide all-electric bus fleet. It also aims to convert all 17,000 taxis to electric ones by 2020, and as of early 2018, more than 63 per cent of them are electric.